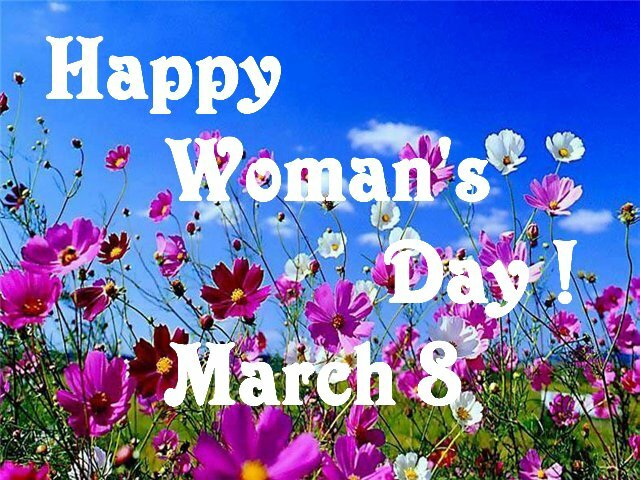 Women all over the world celebrate their day - International Women's Day - on March 8. On that special day, every woman is being in the center of attention, waiting for congratulations from her family members, relatives, friends, co-workers, etc. Women's Day is not only a celebration but also a great occasion to let all women know that we celebrate and feel their importance in our lives. Women from all around the world, regardless of their nationality, religion or color ,feel the unity and the appreciation they deserve on this special day. Many countries even observe the day as a national holiday out of respect for women. International Women's Day is currently an official holiday in Azerbaijan, Afghanistan, Armenia, Belarus, Burkina Faso, Cambodia, China (for women only), Cuba, Georgia, Guinea-Bissau, Eritrea, Kazakhstan, Kyrgyzstan, Laos, Madagascar (for women only), Moldova, Mongolia, Montenegro, Nepal (for women only), Russia, Tajikistan, Turkmenistan, Uganda, Ukraine, Uzbekistan, Vietnam, and Zambia. On 8 March, men and women present flowers, postcards with poetry, chocolate, and other pleasant gifts to their mothers, wives, grandmothers, sisters and daughters. But traditionally, women expect attention, flowers, gifts and pleasant surprises especially from men. In some countries, on that day, some men like to undertake all household duties -- from washing dishes to cooking dinner and looking after children, so that women can enjoy a full day of rest. Women's Day is similar to the Mother's Day, which is mostly celebrated in the United States, Turkey, European countries, India, Japan, Australia, etc. International Women's Day has been celebrated by the United Nations on 8 March since 1975. This year's theme for International Women's Day, "Equality for women is progress for all" emphasizes how gender equality, empowerment of women, women's full enjoyment of human rights and the eradication of poverty are essential to economic and social development. It also stresses the vital role of women as agents of development. "Countries with more gender equality have better economic growth. Companies with more women leaders perform better. Peace agreements that include women are more durable. Parliaments with more women enact more legislation on key social issues such as health, education, anti-discrimination and child support. The evidence is clear: equality for women means progress for all," UN Secretary-General Ban Ki-moon said in his message for 2014. Azerbaijan is one of the countries that widely celebrates the International Women's Day. March 8 is an official holiday in the country. On that day all the woman across the country receive special attention, and men congratulate their beloved women and express the most sincere wishes to them. Walking in the streets on that day, one can see many people with beautiful flowers and gifts in their hands rushing to delight their dears. This is a holiday for all women, but mothers get special attention on that day. Specially, children try to surprise their mothers with gifts. The Azerbaijani society accepts women as a symbol of elegance and beauty. An Azerbaijani woman is the epitome of tenderness, care, and wisdom and is considered as a protector of the household. Azerbaijani woman is a careful mother, beloved and loyal wife, capable householder, wise public figure, and brave soldier. Women have played an important role in the Azerbaijani society over the centuries. It is not coincidence that Azerbaijan was the first country to grant women the right of vote, which is the fundamental basis of a democratic society. Nowadays, the women are closely involved in the socio-political, socio-economic, scientific-cultural, and other aspects of life in Azerbaijan. The State Statistics Committee of Azerbaijan reported that as of early March 2013, women accounted for 50.3 percent of the total population of the country, or 4,772,400 people. Some 57.3 percent of women are in their reproductive years, and, on average, every 10 women gave birth to 22 children, in 2013. According to the report, 46.4 percent of the newborns were girls. The issue of maintaining strong health of the women is one of the priorities for the Azerbaijani government. There are 22 maternity hospitals, 152 centers on counseling for women, 275 children's clinics in the country. Life expectancy for women exceeds the life expectancy of men by 5.3 years, making up 76.6 years. The total number of women actively participating in the social and economic life of the country comprises 48.4 percent of the total employed population. Most of the working women in Azerbaijan are involved in the educational sphere. Women account for 76.2 percent of the total number of teachers in secondary schools, 77.5 percent of the total number of teachers in vocational schools, 47.2 percent of the teachers in higher educational institutions. Also, 64.4 percent of the doctors working in the country are women. Women also play a major role in the development of science. Some 49.2 percent of PhD candidates and 51.2 percent of all academics are women. Three academic and 11 associate members of the Azerbaijan National Academy of Sciences are women. The overall percentage of women in public service stands at 28 percent. Some 17 percent of entrepreneurs are also women. Azerbaijani women have made significant achievements in sports, as well, as 39.7 per cent of them are involved in sports. Female members of the parliament hold 16 percent of the seats. However, no matter how powerful, skillful, intelligent, and smart are women, they always feel the need for the men's protection. Know the value of your beloved women, pay attention to them, and express your love and wishes by beautiful words not only on March 8, but all the days of the year. Make every day March 8 for them!